Multi-talented Laurie Fisher has been entertaining dancers and inspiring musicians full-time for the past 17 years. She can fiddle, play piano, call dances, teach and enthuse with the best of them. The very thriving Asheville contradance scene has been passionately influenced by her bands and music over the past 25 years. She is regionally well known as the fiddler for The String Beings, an Asheville Contradance band whose success has traveled them from Boston to Florida, and California to Michigan and even Texas. They have produced and continue to sell three recordings, with many repeat sales to folks who 'just wore theirs out'. The String Beings are known for their relentless edgy rhythm and the good ride that it provides, punctuated by exciting, well-executed musical tricks of the trade. In addition to contra music from many latitudes and eras, the Beings can put on a swing or couple dance, concert, and the occasional Jewish wedding. They have been featured at dance weekends and events for the past 15 years. 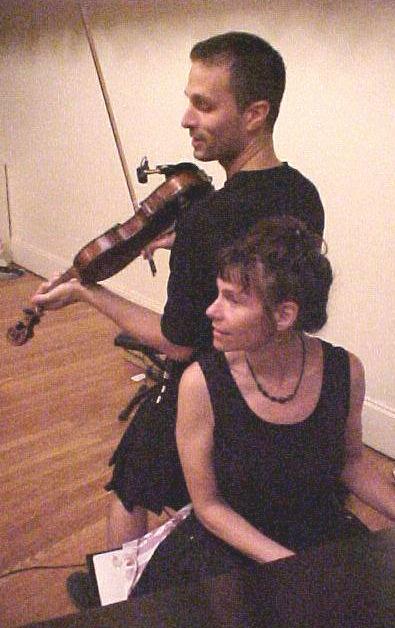 Laurie also plays with Karen Gaughan, Asheville's most in demand contradance piano side-girl. They often perform as a duo, but can't settle on a good band name. . .so look for them as 'Hair of the Fish', or 'Hot Flash', or in moments of indecision, 'Laurie Fisher and Karen Gaughan'. The two provide a full sound, plenty of rhythm and a really good ride for the avid contradancer or waltzer. The main comment from the floor when these two play is an amazed, "I can't believe there's only two of you!" There are two somewhat regular augmentations if this dynamic duo. . .'Holy Coyote' and 'Fiddlewitch' build on the solid piano/fiddle combo with the addition of a drum set, concertina or mandolin. . . the good ride gets better. . . .
Laurie plays piano with David Knight in the high energy duo The Evil Twins, at contradances, Scottish Country Dances and the occasional house or bar concert. Playing with David gives her a chance to express her Celtic soul and release her inner-rhythm-player-trapped-in-a-fiddler's-body. Look for their first cd 'The Underground Dance Conspiracy' to be available sometime this year. Five years ago, she joined the Atlanta Swamp Opera Cajun and Zydeco band where she plays the bright red Ashbory bass, some triangle and vocals. They have been featured at the famous Dance Vortex Cajun/Zydeco dance weekend for the past two years, much to the dancers' delight. 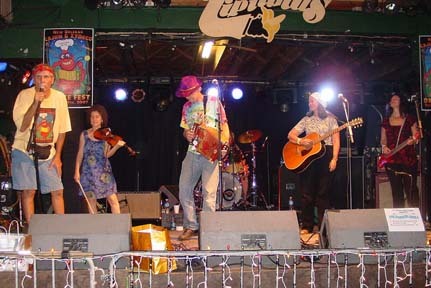 In Dec. 2007, they were privileged to be the only 'Yankee-Chank' band invited to play with a stellar slate of Cajun and Zydeco bands for the Dance Fest at Tipitina's in New Orleans. Laurie loves to sing and play guitar in Honky-tonk, Swing and Texas Swing bands. Before graduations and busy schedules broke them up, she performed with her 'dancers-rule' swing band, The After Midnight Band of Pleasure (keyboard AND 3-pc horn section, ooh-la-la!!) She now plays upright bass with Asheville dance band 'Swing Away', featuring sweet vocals and swingin' fiddle. In 1989 she founded the Asheville Contradance, a monthly Saturday night dance at the Jewish Community Center of Asheville. In 1990 she hosted the first Asheville Summer Soiree, a June contradance weekend in East Asheville. Both dance productions continue, and enjoy an enthusiastic following although Laurie retired from full time dance production in 2001. She teaches contradance, waltz-and-other-easy-couples-dances, and has developed a class 'Dancing on the Right Side of the Brain' to teach all dancers the mysteries of effortless and joyful dancing/partnering. Laurie also calls for Appalachian Big Circle and traditional 'barn' dances for camps, weddings, reunions and retreats. She is one of the best callers for getting non-or reluctant dancers moving and cheering whatever their age. In 2003, Laurie started impersonating a second violinist and continues to perform with the Asheville based Blue Ridge Orchestra, St. Matthias Concert Series, and Jubilee Summer Orchestra. She can never get her fiddle bow in synch with the other players, but continues to soldier on playing in awkward 'non-fiddle' keys and positions and working on vibrato and reading all those dots and Italian words. Laurie teaches music, mostly fiddle, piano and guitar, plus the occasional clawhammer banjo, voice, pennywhistle or bodhran students, primarily at the oh-so-sweet Acoustic Corner in Black Mountain, NC. New players look forward to her facilitated jam sessions/workshops where beginners are easily assimilated and directed. For vacation, Laurie enjoys attending Ashokan Western & Swing Week, hosted by some of her heroes, Jay Ungar and Molly Mason. . . she hopes to become a tolerable swing fiddler one day. Laurie is experienced at a wide variety of crafts, from hair braiding to blacksmithing. The list is much too long to put here - - but she is a terrible cook, very bad at math and drives too fast! She has been known to tell offensive jokes, sleep all morning, and turn rude people into toads. Rumor has it that she seeks advice from the voices in her head and other channeled entities. It is well known she regularly stays up too late. "I have been dancing to contra music since 1979. 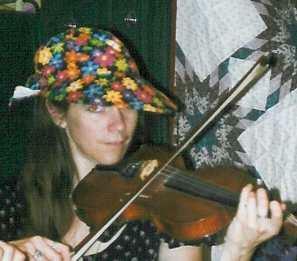 Of all the fiddlers I've heard I believe Laurie Fisher is one of the best contra dance musician in the southeast. There have been many times when I've been dancing and thought ‘man she’s good.’ Over the years she has accumulated a vast repertoire of contra dance tunes and all ways plays them with the dancer in mind. It was her love of dance that made her pick up the fiddle. Also let’s not forget her waltz music. The best Sunday morning waltzing at Knoxville has been played by Laurie Fisher. I look forward to hear Laurie grow and explore new dance music while always keeping the dancer in mind". "Lessons are fun and I look forward to them. My other teacher taught me how to play the notes, but Miss Laurie teaches me how to play music." "Laurie took my adult need for perfection and my performance anxiety and turned them into a wolf whistle and a new passion for the fiddle!" "Dear Miss Laurie, The reviews and thanks are in. Each of the cds I gave away went to dancers who are busily wearing them out in cd players, literally across the world. From the tone of the responses, you would think I had given out something like a naughty adult toy! Maybe one day I will get a waltz with you (you danced with my wife once and she wont let me forget that I haven't gotten a dance yet!) "
"In the past month, 'Late for the Dance' has been a constant source of joy to me, its literally been a life saver for me. I cannot find words to describe the hope, comfort and joy your music opened for me during a very traumatic period. My 11 year old hyperactive son who generally cannot stand my taste in music, literally vibrates in time to the music on 'Late for the Dance'"
"Dear String Beings, . . . The music and your enthusiasm made me want to dance on and on. I'm listening to your cd right now and find myself dancing across the kitchen floor!" "I thoroughly enjoyed your waltz workshop Sat. afternoon. Finally, someone taught what dance is really about--movement of the soul! It was very effective and I got totally lost in the waltz for the first time ever. . . I felt so clear-headed afterward." "We enjoyed all of the Beings soo, soo much! You are all such wonderful Human Beings. We just love you!" "Dancing to the String Beings is like . . . you know . . well . . . it reminds me of multiple orgasms . . . there's a big thrill . . . and you know there will be more." "When I listen to their tape in my car it makes me drive too fast." "I listen to their CD at my house and just have to stop what I'm doing and spin around." " You should tell people they shouldn't listen to your cd while shaving!" "The other band was great, buy you guys gave me goose bumps! And there's only three of you!" LC, caller's wife "Your tape was one of the three I took to the hospital to have my baby." "You guys . . . you're just so . . so . . you . . you just know what to do!" "I got a $140.00 speeding ticket because of your tape!" K, dancer "Every time I really like the music I look up at the stage and Laurie's in the band"
"Dear Laurie, I must tell you how much I enjoy listening to 'The Sweetheart Tree'. It seems I enjoy it more each time I hear it. It lifts the spirit. I spoke with Auntie Therese yesterday and told her I was house cleaning and listening to your tape, she said she was cleaning and listening to your tape also. God certainly gave you great talent. . . I'm glad you use your talent to make people happy."